After record equity fund outflows in December, which saw hedge funds throw in the towel and liquidate hitting any bid they could find, which resulted in the worst December for the S&P since the great depression, "there’s definitely been a change in tone, and it’s definitely risk on,” portfolio manager Matt Kennedy at Angel Oak Capital Advisors told Bloomberg. "This reversal has reinstilled some of the confidence the market had prior to October that the expansion can continue." Sure enough, according to the latest EPFR data collated by Bank of America, in the week after the bank's "Buy Signal" was triggered on January 3, there was a whopping $7.2 billion inflows into bonds, $6.2 billion into equities, and $1.1 billion into gold as investors scrambled to reallocated funds to both risk assets and safe havens. As BofA notes, investors bought a little bit of everything including international equity funds ($3.8bn), government bonds ($3.6bn), EM bonds ($2.4bn), EM stocks ($2.4bn), and HY bonds ($1.5bn), even as they still sold financial stocks ($1.5bn), IG bonds ($1.4bn), and tech stocks ($0.6bn), although one wouldn't know it by looking at the performance of FANG stocks in the first two weeks of the year. Furthermore, as BofA's chief investment strategist Michael Hartnett notes, investor feedback to the bank's "buy signal" was initial skepticism on size & duration of rally and obsession with "is this the Big Low?" which however quickly morphed into "chase via stocks in EM & US"... if not Europe. Additionally, few are bullish tech & financials suggesting that the recent rally in tech has been largely a short squeeze. Meanwhile "leadership" remains a major issue, as do fears that we are in a "late-cycle", coupled with questions on "what can sustain rally?" For now, however, these questions remain on the back burner as BTFD has returned with a bang in a week that saw the first high-yield bond issue in six weeks as Targa Resources came to market with a $750MM bond issue, ending a record 40-day drought for bonds. And lo and behold, the offering was so greatly oversubscribed, the final deal was doubled in size to $1.5 billion. There was also a burst of euphoria in the IG space where investors ignored the latest fallen angle as PG&E was cut 5 notches by both S&P and Moody's to deep junk, and poured in nearly $40 billion of orders for a bond offering from AB Inbev on Thursday. This also lead InBev to upsize its offering to $15.5 billion. 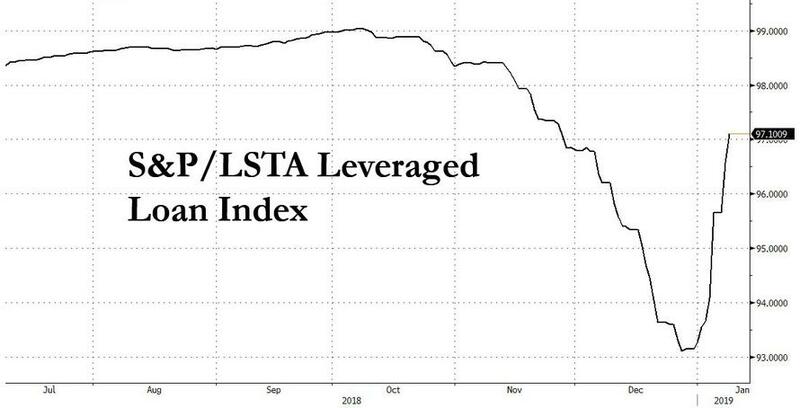 More importantly, leveraged loan outflows are abating, and after several weeks of record outflow, last week saw just $0.4BN in bank loan outflows, helping prices recover across the board as investors regain confidence that the economic expansion has more room to run. And as one would expect, banks are seizing the opportunity to offload risky corporate loans that they were unable to sell in December, enticing buyers with discounts and better terms. Still, as Bloomberg notes, the rally has many strategists asking "how long it will last." Leveraged loans are unlikely to continue the ride because the best of the credit cycle is behind us, Bank of America said this week. In the high-yield market, where spreads have tightened by a whopping 75 basis points since the end of the year, any further rally “is likely to be limited and more gradual,” UBS strategists said this week. In the high-yield market, where spreads have tightened 75 basis points since the end of the year, any further rally “is likely to be limited and more gradual,” UBS strategists said this week. 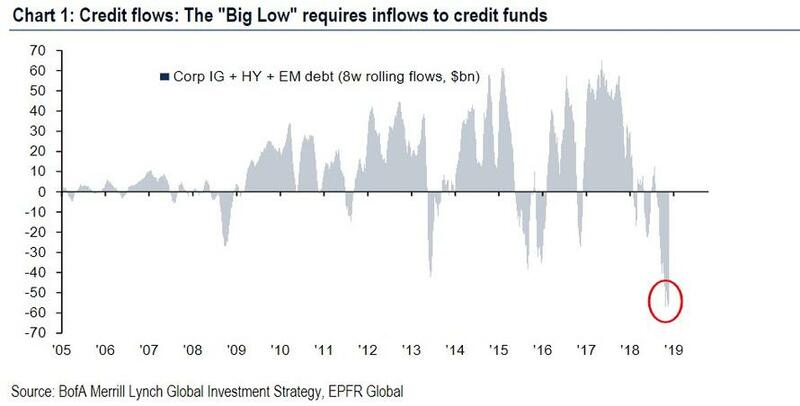 Inflows to credit funds signaling Fed has short-circuited vicious cycle of higher credit spreads & weaker growth; past 8 weeks has seen a significant $62bn of outflows from IG+HY+EM debt (Chart 1). 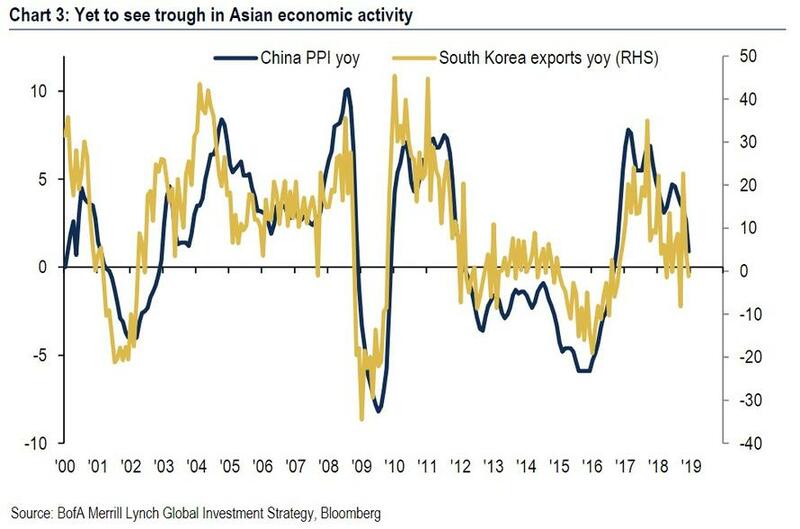 "Green shoots" in Asia/European macro as oil collapse/policy stimulus works signaling global PMI's (latest 51.5) not entering "bust" territory (sub-50) & global EPS growth stays positive 2019 (Asian exports & activity best lead indicators - Chart 3). So until we await these two signals to hit, Hartnett has two trade recos: Own the "Credit" theme, Rent the "Cyclical" theme. Rates have peaked: Fed has capitulated; inflation expectations are falling; moment of Maximum Quantitative Tightening will be end-March (CB balance sheets growth to trough in Mar'19 @ -$0.4tn YoY - Chart 4); note EM credit already leading EM stocks higher (Chart 5). Own "credit" theme: yield of blended portfolio of global HY, EM $-debt, US IG, US bank loans, US preferred jumped from 3.7% to 5.4% past year - now attractive (Chart 6); 3% "big top" in yields negative banks (Chart 7), very positive homebuilding stocks & small cap too.